The great thing about Aziza besides the delicious food and being more affordable, is that parking is easy to find on Geary Street…minus the fact I locked my keys in my car! I loved the atmosphere of the place, not to fancy, some booth seating, full bar, and cool decor! As I waited for Serena, I decided to try the Mango cocktail – (coconut water, basil seed, and gin) all of my favorite things! It was really good, not to strong, and the basil seeds added a nice touch. We decided not to do the pre-fix menu and share a few dishes. 1. Duck Basteeya – one of their signature dishes that is always on the menu…now I know why. 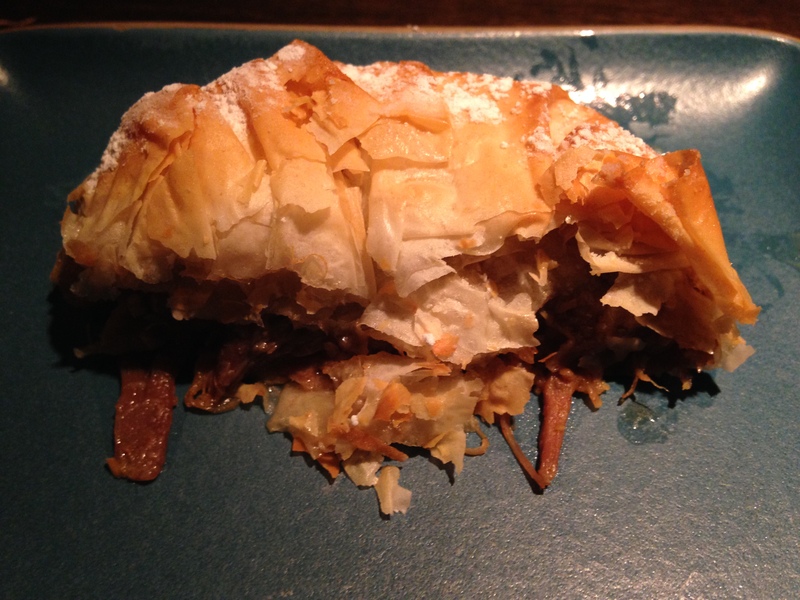 So delicious, good portions of duck meat with small bits of almond and raisin wrapped in a puff pastry! Comes out hot, they even cut it in half for us to share. 2. 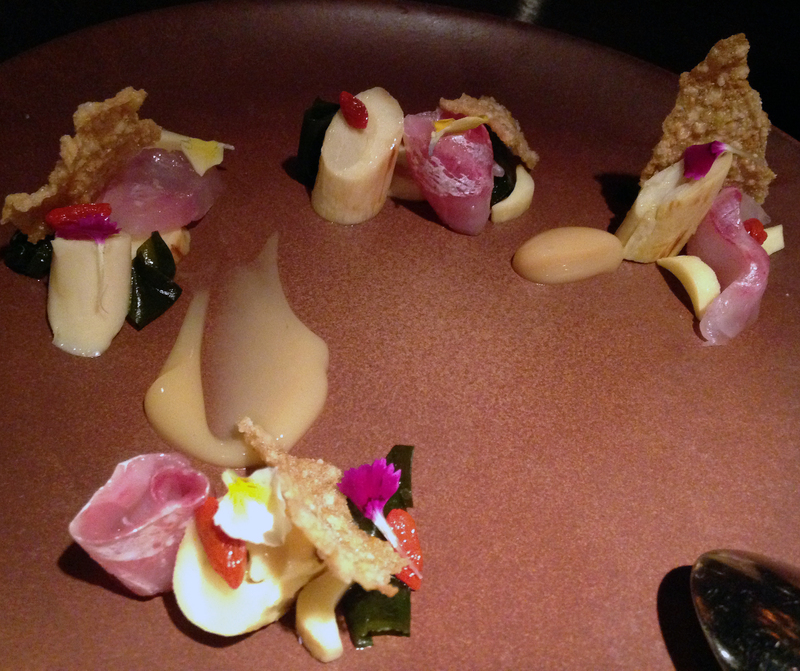 Raw Fish with hearts of palm – one of our lighter dishes, but the fish is amazingly fresh. Went well with the crunchiness of the cracker and seaweed. 3. Beef Cheeks – Serena and I debated on if we should get the cheeks or the Cornish hen, the waiter seemed excited about the cheeks so we went with her suggestion. After having such great dishes, this one was a little disappointing and not what I expected. The beef wasn’t as tender as I thought and the beet cubes were a little weird as well. However the bone marrow crouton… so deliciously bad! 4. Strawberry desert – I do not quite remember the name, but this desert was SOOO amazing. Most places don’t usually have dessert you are blown away with, this was one of the best dessert I have had!